Scotch on the Rocks is a luxury villa, resting on Ocho Rios's beautiful Sandy Bay, only five minutes from the town center and attractions. From the outside in, Scotch on the Rocks captures Jamaica's beauty and laid-back vibe. Set amid a brightly colored tropical garden, the villa's turquoise exterior walls mirror the brilliance of the Caribbean Sea. Inside, the villa's clean and fresh décor is tastefully accented with Jamaican mahogany furniture, travertine tile floors, intricate fretwork, Caribbean art, and Chinese accessories. The two-storey villa has 4 + bedrooms and 5 full bathrooms. All bedrooms have air-conditionings, new travertine tiled full bathrooms, mahogany or travertine floors and antique Jamaican furniture. Each bedroom is luxurious and comfortable with fine bed linens, plush duvets and down pillows. The three upstairs bedrooms each have a private verandah, overlooking the Caribbean Sea or tropical garden. The fourth bedroom is attached to the main house in its own cottage suite, and opens onto the breakfast patio and garden. Looking out onto the deck and sea, the newly expanded T.V. room can be converted to a fifth bedroom with a queen-sized pull-out sofa bed. Overlooking the Caribbean Sea, the villa has a private swimming pool, nestled between the breakfast patio and main veranda/deck. 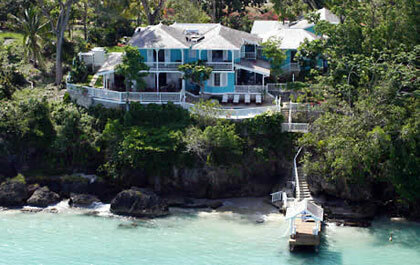 Below the pool area is the villa’s gazebo and private pier, with a shallow, sandy access to the turquoise sea. Scotch on the Rocks guests enjoy a complimentary membership to Royal Plantation Resort’s Gym and Sauna. This membership gives Scotch on the Rocks guests access to the resort’s tennis courts at a small additional fee and also entitles guests to a 25% discount on all of Royal Plantation’s Spa treatments. Scotch on the Rocks is also located within 10 minutes of the Upton Golf and Country Club. Contact us to book this luxury villa in jamaica. Are you thinking about getting married at a villa in Jamaica? See our weddings page.